Granted California isn't considered very cold, but since this is the only winter I know- it's cold for me! 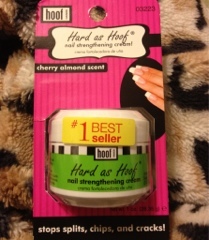 I saw someone post a picture of Hoof Hands Hard as Hoof nail strengthening cream on instagram and was on the hunt for it. I looked at Target and Walmart but left empty handed. I stopped by Walgreens to see what kind of sales they had and lo and behold there it was and even better it was over half off at only $3! I also picked up a beautiful lilac polish by Rimmel- it was a UK Rimmel polish! I've always liked the bottles when looking at UK blogs- not sure if these are limited edition or not but hope they are here to stay! It applied easy with two coats and dried pretty quick- not sure about the 60 seconds claim. After a few minutes I applied the cream (it states you can apply while polish is on). It feels divine! It has a cherry almond scent- I love this scent, reminds me of my childhood for some reason! It's only day one but I'm hopeful as my nails are always splitting and peeling- uggh! Will keep you updated! Any other cream, nail strengthening treatments? Please leave me some ideas!